Whether you owe a lot or a little, one thing’s for certain: If you want to get control of your finances and pay off your debt, you need a budget, and you need a budget that works. If you’re one of the many Americans who has tried to budget before and failed, you aren’t alone. Many Americans have trouble making and sticking to a budget. 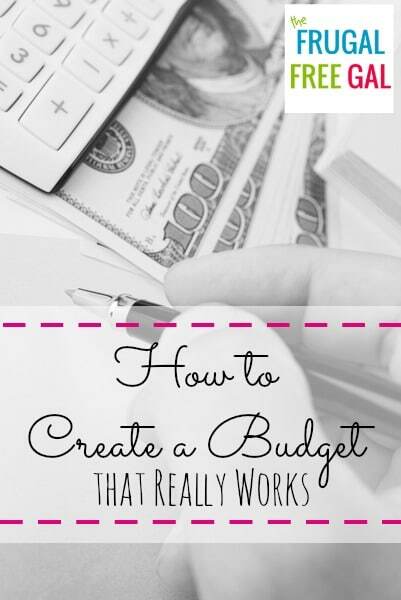 The good news is, creating and keeping a budget that really actually works doesn’t have to be so difficult. Just follow these five steps! Before you can figure out where you’re going, you have to figure out where you are now. Print out the last few months of bank and credit card statements. Get out a sheet of paper and write down how much you make every month (from work, child support, loans from your parents… everything that comes in). If it varies, write down the lowest amount you consistently make. Then, write down ALL of your expenses and how much you spend on them. This includes bills like the mortgage, groceries, and cable as well as all the little things like gas station snacks, Starbucks trips and Target runs. If you use cash and you don’t know where your money is going, put that money in a “cash” category. While you’re writing down numbers, go ahead and write down all of your debt on a separate piece of paper as well. It’s time to get honest. For most people, budgets themselves aren’t intrinsically motivating. Therefore, if you want to succeed, you need to figure out your why. Do you want to get out of debt? Do you want to be a stay-at-home mom? Do you want to save up for a nice vacation? Figure out your motivation, and then put a tangible reminder where you can see it. For example, you might put a picture of a beach house on the fridge. This will help motivate you when times get tough. Once you figure out what you’re making and spending, it’s time to adjust the numbers so everything fits. On a clean sheet of paper, list ALL of the things you spend money on each month, and divvy up your income into each category. Your grand total of expenses has to be equal to or less than your income (with wiggle room!) for your budget to work. Do your best to make your numbers frugal, but realistic. After all, if your budget is unrealistic, you won’t be able to stick to it. Make sure you include a category for fun or anything else that you HAVE to have as well, even if the category is small. Depending on how much you need to cut back, you may need to get rid of some things, sell some things, work longer hours or even get another part time job. But you CAN make it work. It might just take work and sacrifice. 5. Stick to the Budget! Lastly, stick to the budget and wait! It won’t be long until your debt starts slowly melting away, your savings start piling up, and you experience financial freedom like you’ve never felt before! Just imagine how amazing that will feel! Your debt isn’t going to get rid of itself, and the longer you wait, the worse it will get. The time to take action is now. Start today and bring yourself one step closer to financial freedom. Do you need to take better care of your finances this year? What’s standing in your way?